The Ford Focus is to get a new low capacity turbocharged engine as of February. Despite its small size the 1.0-litre turbocharged EcoBoost engine delivers as much as 125PS, which is similar to the 1.6-litre petrol Ford currently offers in the range, but with lower emissions and improved economy. Cars fitted with the new engine will be priced from an estimated £16,245 when they go on sale later in February, and will be exempt from VED in the first year. Second year VED rates will rise to £20 for the 100PS version and £30 for the 125PS version. The 1.0-litre EcoBoost has three cylinders and is offered with two power outputs, 100PS and 125PS. The former manages 58.9mpg and 109g/km of CO2, and the latter delivers 56.5mpg and CO2 of 114g/km, figures that would better fit a diesel engine than a petrol. Astoundingly, Ford claims that the engine block fits on an A4 sheet of paper, but despite its size and emissions it delivers 170Nm of torque, or 200Nm with overboost, with peak torque available from 1400rpm right through to 4500rpm. 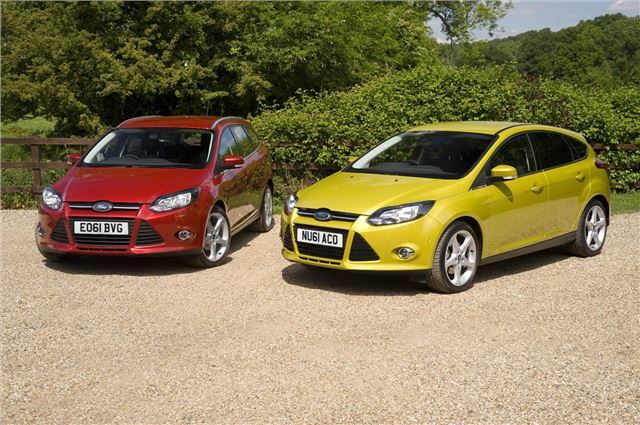 The new engine will initially be offered in the Focus, but will later be available in the B-MAX, C-MAX and Grand C-MAX.